Entitled “You are not the API I used to know: On the challenges of studying social media data”, the 7th annual DMI Summer School took place from 24th June to 5th July 2013 at the University of Amsterdam. This year’s Summer School generated tremendous interest and the turnout has never been this high. Participants attended lectures and workshops from experts in social media data and mapping, and conducted a variety of research projects. One larger research project conducted at the DMI Summer School was dedicated to the mapping of climate change. The aim of this project was to explore the uptake of climate change issues across platforms and over time. The platforms included in this study were: the Google search engine, Google Trends, Twitter and Amazon. We asked: are there different discourses in the climate change issue space across platforms? Are these time-specific? Geo-specific? Platform-specific? User(type)-specific? As a starting point for the cross-platform research first a list of keywords associated with each of the three approaches (scepticism, mitigation and adaptation) was build. This was done in a rather experimental but effective way, namely by means of the Amazon Book Explorer tool. As search terms, the three approaches to climate change (scepticism, mitigation and adaptation) were queried. As a result, the tool output the most popular books associated with the terms and any relevant metadata about them. From the book titles the researchers manually captured keywords, which were later cleaned and compiled into three different lists. After compiling the three lists of keywords, their uptake in the different platforms was analysed. By means of the DMI tool TCAT (Twitter Capture and Analysis Tool), Twitter was queried for the presence of each of the keywords over a period of 7 months, as well as Google.com for a period of 10 years by using the Wayback Machine. For the platform Twitter it was also of interest which clusters can be identified within tweets on climate change, which resulted in a co-hashtag map (figure 1). This revealed that some geo-locations appeared to dominate the discourse, such as Australia and US (politics, flood and drought), and Canada (flood). Interestingly, the top clusters do not particularly match vocabularies of scepticism, mitigation and adaptation. Further, it was examined who the users of these hashtags are, and if certain hashtags relate to specific events. We found political polarisation among the users of conservative and progressive hashtags within the cluster around the Obama speech on climate change. Figure 1: Twitter hashtag clusters around the hashtag global warming/climate change. Depicted as network graph. 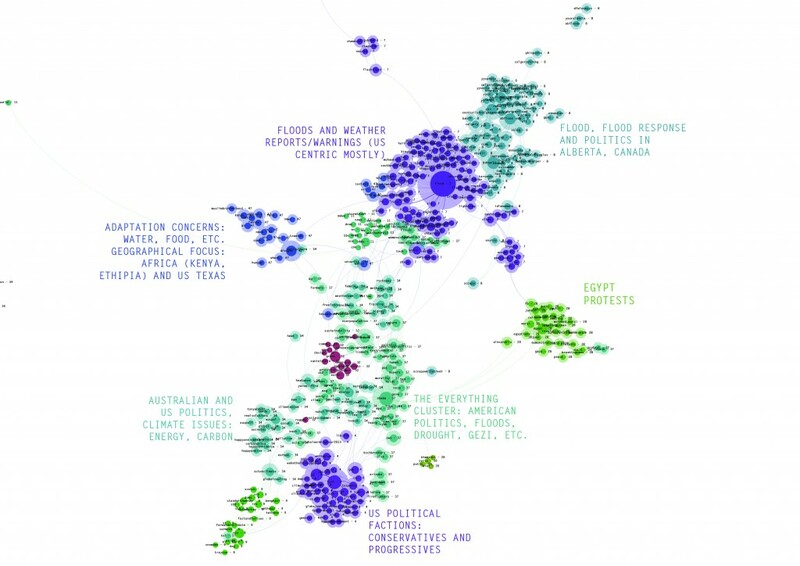 The visualization reveals clusters around geolocations such as Australia and US (politics, flood and drought), and Canada (flood), with each color representing a different cluster. Source: Hashtags associated with the queries [global warming], [globalwarming], [climate], [climatechange], [drought], [flood], collected through the DMI Twitter Capture and Analysis Tool (TCAT). Queries performed between Nov. 2012 – June 2013. The sub-project on climate change popular language uptake on Amazon is another interesting project, as Amazon is approached and repurposed as a research engine rather than a mere online retailer of books. Here the question is what sub-issues in the climate change debate sell best over time and how the uptake of the different sub-areas of climate change (scepticism, mitigation and adaptation) evolves over time in the mainstream literature. For scepticism most of the successful language emphasizes the scandalous and urgent nature of deception, such as: “corruption”, “conspiracy” and “hoax”. The keywords or sub-issues captured for mitigation and adaptation are clustered around shared terms, even though they obey a different logic. When seen in a (issue) timeline (figure 2), it appears that popularity for mitigation and adaptation centers around more recent published books, while best selling books in the realm of scepticism is composed of both older and newer titles. This indicates that keywords used on the subject of climate change scepticism in mainstream literature remained relevant over the years. As for popularity, the analysis on Amazon’s query autocomplete system revealed that adaptation and several keywords associated with scepticism are suggested while mitigation is not, perhaps indicating a less popular or effective terminology. Figure 2: Climate change formats and keyword uptake. Depicted as bubble matrix. 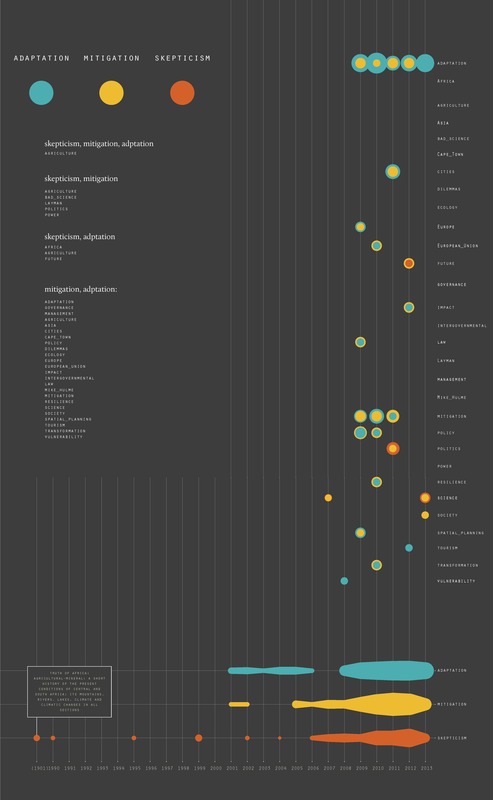 The visualization includes on the right side the keywords captured from book titles, and below the year that corresponds to each of the books from which the keywords were captured. Every approach to climate change (adaptation, mitigation and skepticism) is depicted with a different color, allowing to identify overlapping and repetition amongst keywords. Source: best sellers books in Amazon.com associated with the queries [climate change mitigation], [climate change adaptation] and [climate change skepticism]. Queries performed on 30 June 2013. This last project has caught our interest on how Amazon can further be repurposed as a research engine as a means to map issues. © 2012 EMAPS | Powered by WordPress | Theme 'Sirup' by 1000ff | 41 queries 0.251 sec.